For the 2013 holiday season my gift to students and colleagues at the Faculty of Information (and beyond) was a game called The Gingerbread House of Information. The Gingerbread House of Information is inhabited by information scholars (broadly construed) and other great iSchool citizens. It was on display at the Inforum from November 26 to December 6, 2013. iSchoolers used the clues, listed below in the photographs, to identify the 10 residents and then entered their answers into a raffle to win The House -- which was entirely edible except for the photographs. There were more than a dozen entries in the raffle and the winner was drawn by Dean Seamus Ross at the end-of-the season iTea. The winner, initially, was Dr. Kelly Lyons. Unexpectedly (and in the spirit of the holiday season), she gave The House to fellow professor Dr. Periklis Andritsos, saying that it would be enjoyed more by his family and two young sons. A photo of this heart-warming occasion is below. Dr. Andritsos has since reported that each day he is teaching his boys about the residents of The Gingerbread House of Information. 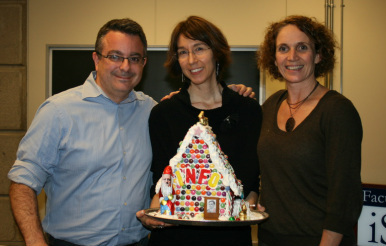 Dr. Periklis Andritsos (left), the winner of The Gingerbread House of Information; Dr. Jenna Hartel (middle) the baker; and Dr. Kelly Lyons (right), who initially won the House and then gave it to Dr. Andritsos and his family.